Dr. Chen conducts research in the areas of lung and head and neck cancers. A Georgia Cancer Coalition Distinguished Cancer Scholar, Georgia Chen, PhD, is an Associate Professor in the Department of Hematology and Medical Oncology at Emory University School of Medicine. Prior to joining Emory, Dr. Chen was Associate Professor at the University of Pittsburgh Cancer Institute. Dr. Chen is a well-trained molecular oncologist with experience in the molecular analyses of oncogene expression, gene regulation, cellular signal transduction, and using animal models for lung and head and neck cancer. Dr. Chen received her PhD from Louisiana State University in Baton Rouge, LA. After postdoctoral training, she received her first faculty position at the University of Texas Dental Branch, as a Research Assistant Professor and was then elevated to a tenured track position at M.D. Anderson Cancer Center. Dr. Chen's research focuses on the metastasis of head and neck cancer, signal transduction pathways in cancer cells, prognostic and therapeutic biomarkers, anticancer therapeutic drugs for treatment of cancer,and usage of nanotechnology in cancer research and clinical application. She has established a human xenograft metastatic mouse model for head and neck cancer, which has been used in studying the biology of cancer and in the evaluation of therapeutic agents for cancer treatment. 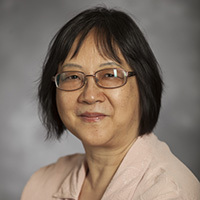 Dr. Chen is currently project leader for the Head and Neck Cancer SPORE supported by NIH, and a project funded by the US Department of Defense. She also served as PI on a project for identifying metastasis–related proteins in head and neck cancer using nanotechnology, and as a co-investigator for several projects related to prevention and treatment of lung and head and neck cancers using targeted small molecules and nanotherapeutic drugs. These studies have generated 130 publications in peer-reviewed journals. As principal investigator in the study of head and neck cancer, her work has been supported over the past few years by several awards from the US National Institutes of Health (NIH). She has been named to the MilliPub Club several times, which recognizes current Emory faculty who have published one or more individual papers throughout their careers that have garnered more than 1,000 citations.